The details on a crocheted garment can really make a difference between a project that looks neatly finished or one that looks hastily put together. Crochet buttonholes that are unevenly spaced or the wrong size for the buttons can ruin the look, and the functionality, of your whole project. Luckily there are a few easy ways to crochet buttonholes. Before you begin your buttonholes, plan out the positioning of your buttons using a tape measure to make sure they are evenly spaced. Place stitch markers in the locations where the buttons are to be sewn. Keep in mind that on women’s garments the buttonholes are on the right side of a garment, and on men’s they are on the left side. Next, choose the style of the buttonhole that you want to use for the project and work them to correspond with the marked positions for your buttons. Detailed below are a few buttonhole style options. The most common buttonhole is the two-row buttonhole because it is easy to do and can work with any size button. The two-row buttonhole can be worked without using a separate front band. For horizontal buttonholes, line up the positioning with the button markers by counting the number of rows between the lower edge of the garment and the button marker and between each button marker. Counting the same number of rows, place stitch markers in the corresponding rows to indicate the placement of the buttonholes. To work a two-row buttonhole, crochet a few stitches in from the edge of your item, usually about 1/2 in. or so (see Fig. 1a). Then chain the number of stitches that correspond with the size of your button (the chain should be slightly smaller than the diameter of the button; see Fig. 1b). Skip the same number of stitches that were chained and continue crocheting normally across the remainder of the row (see Fig. 1c). On the following row, when you reach the chain-space, crochet the same number of stitches into the chain-space as were chained and skipped (see Fig. 1d). Make sure to test the buttonhole with your button. The button should go through easily but without slipping through. If the buttonhole is not the right size for the button, pull the stitches out and adjust the number of chains used to make the buttonhole. If the body of your garment was worked horizontally, you will need to crochet a vertical band in order to work vertical buttonholes. To do this, pick up stitches along the edge of the garment and work two rows of single crochet. For vertical buttonholes it is important to make sure that the center of the buttonhole lines up directly with the center of the button. Once the placement is marked, work the buttonholes as described above for horizontal two-row buttonholes. Crocheted button loops are a nice alternative to buttonholes. Crocheted loops are worked on the edge of the garment in the last row or the last two rows. One row is usually sufficient when working with heavier yarns, but if you are using a lightweight yarn, a two-row button loop will have more strength. Plan out and mark the placement of the buttons and the corresponding loops as described above. 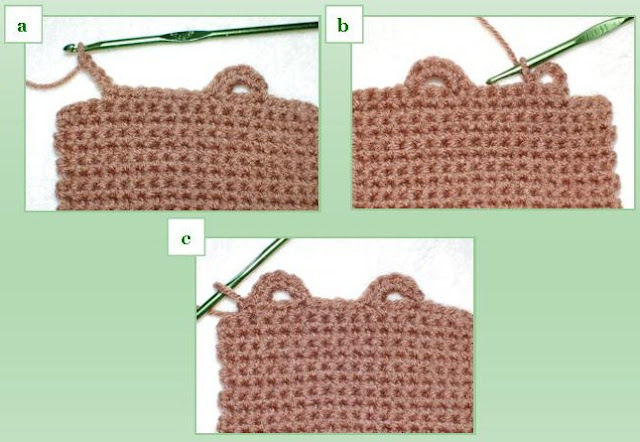 Typically, the row before the loops is worked in single crochet, however other stitches are sometimes used. To make a loop, crochet to the placement marker and chain the number of stitches needed to create a loop that is big enough for your button to pass through but small enough to keep the button in place (see Fig. 2a). For small buttons, it is usually not necessary to skip any stitches before continuing to work across the row or to the next stitch marker. For larger buttons, it may be necessary to skip one or two stitches before continuing (see Fig. 2b). For heavier garments or lightweight yarn, you may want to add another row to reinforce the loops. To do this, crochet normally across this last row, and at each loop, crochet the same number of stitches into the chained loop as were chained (see Fig. 2c). The two-step button loop is my favorite. It is perfect for when a sturdy loop is needed and also adds a nice designer detail. First, plan out and mark the placement of the buttons and the corresponding loops as described above. Next, crochet to the placement marker and chain the number of stitches needed to create a loop that is big enough for your button to pass through but small enough to keep the button in place (see Fig. 3a). Turn, skip two stitches, then work one slip stitch in the next stitch (see Fig. 3b). Chain one and turn so the right side is facing you again. 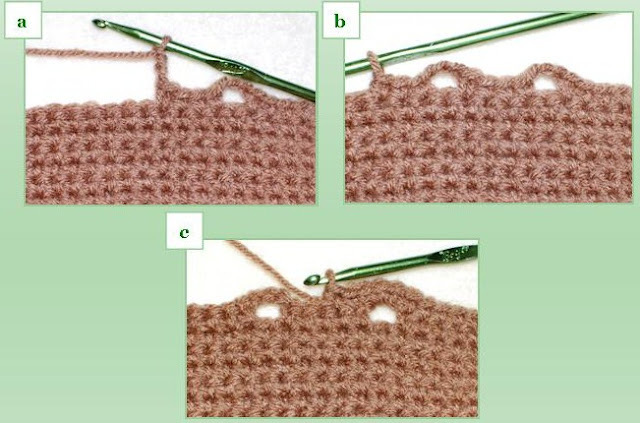 Work as many single crochet stitches as needed to cover the loop (see Fig. 3c). To continue, single crochet in the next stitch and continue across the row or to the next stitch marker. Test the buttonhole for sizing. It is always a smart idea to buy one or two spare buttons in case you need a replacement in the future. Spare buttons can be kept in your sewing kit or be sewn into the inside of your garment. You can usually sew on your buttons with the same yarn that was used to crochet your garment. However, if the yarn is too thick to go through the holes on the button, unravel the strands and only use one or two for sewing or use a matching sewing thread instead. Double thread your needle and knot it at the end. To anchor your knot and keep it hidden, insert the needle into the fabric from front to back to front again (see Fig. 4a). Now insert the needle between the threads at the knotted end and pull through (see Fig. 4b). Trim the excess thread. Now you are ready to sew on your button. When finished, knot thread again under the button, cut thread leaving a tail, weave in tail. Heavier garments can be reinforced by using a backup button. Using a plain shirt button that matches the yarn, attach the backup button on the wrong side of the garment, behind your decorative button. Sew the two buttons together, going through the fabric, taking care not to sew too tightly.